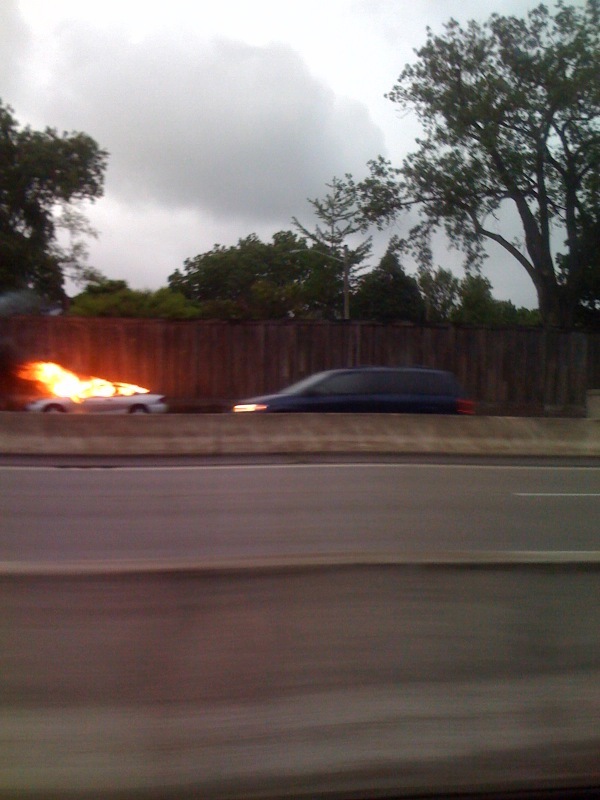 Acknowledgement: Thanks to Jim from Edina, MN, who contributed this picture shot this morning by his brother off I-394 in Minneapolis. Jim is a regular reader, which puts him an exclusive group of about 3 people. Thanks, Jim! Just because you CAN buy a power inverter for your cigarette lighter does NOT mean you should attempt to toast a bagel on your way to work. I hope the guy’s iPhone didn’t get damaged. I cannot wait to Tweet about this. I cannot wait to post this on Facebook. I wonder if he was using one of those combustible laptops while driving. Why isn’t anybody helping him? I would, but I am too busy taking a picture. Smoking while wearing hairspray in closed quarters is not advisable. Aromatherapy candles are best used in the bathroom or bedroom. This entry was posted in Lists of Laughs and tagged Apple, car fire, Facebook, humor, iPhone, Smartphones, Toyota, Twitter. Bookmark the permalink.